As you know, I made my first and second bras using the same pattern, the Marlborough Bra. Considering my lack of experience, I think they both turned out surprisingly well. But here’s a funny thing. Even though I used the same pattern, and the same type of fabrics (silk for the main parts, powernet for the back bands, as specified by the pattern), they somehow turned out different in size— different enough that, although I’ve worn the second bra several times, I can’t wear the first one at all. It’s just too tight around the band. With the back closure fastened on the loosest setting, my first bra measures 13″ across the bottom. And notice how the fabric is bunching up under the cups? More about that later. Without even looking at the tape measure, you can easily see the the second bra (bottom) is noticeably larger than the first: 14.5″, vs. 13″ across the lower front of the band. How could this have happened? Well, I have a few theories. 2. When I was making the first bra, I hadn’t yet learned about DOGS (direction of greatest stretch), and its impact on bra fit. It’s fairly likely I made some mistakes with the DOGS which restricted the “give” of the fabrics, making the bra feel tighter. 3. The powernet on the first bra’s back band is a bit heavier, and slightly less stretchy than the powernet on the second; it certainly seems possible that just the back band fit alone could account for the difference in size. Or maybe it’s all of the above! Wow. That is a BIG difference. Maybe those smaller wires on the first bra (top) are keeping the fabric from spreading out into its actual size? Okay, here’s the thing. It’s not an excuse, but when I was making that first bra, I was treating it like a practice run (which the pattern designer recommends, and it is a good idea in general), so I simply put in wires I’d taken out of an old bra. (Gee, do you think that old one might have been too small?) By the time I was making the second one, I’d received an order of supplies (from SewSassy), including a few different wire sizes to try out. So when I was finishing the second bra, I was able to put in wires that actually fit me properly. I think I’m onto something! I’m going to take the smaller wires out of the first bra, and replace them with the same size wires as I have in my second bra. Cross your fingers— just this one change may solve my fit issue! Whoa. 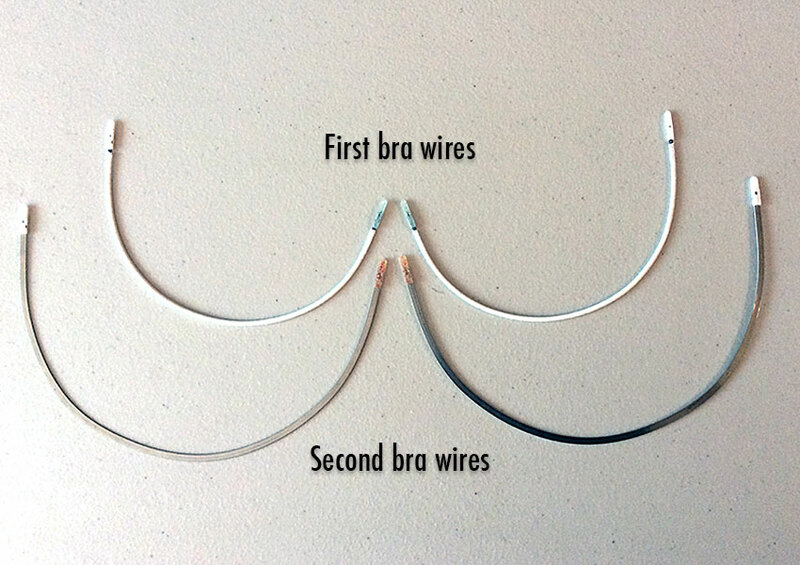 I’ve just taken those wires out of Bra 1, and look at the difference in size! I think it’s safe to say that my wire size was affecting the fit of my bra! I’m so curious to measure this bra again, after changing to the larger wires. What a difference— the space across the cups has increased by 2″! (The tape got knocked over to the left a little in the top photo— I was juggling the tape and the camera.) And the measurement across the bottom of the band has increased by 1″, which means 2″ total. That will definitely make a difference in the fit! Just to double-check the size, I laid the newly-wired bra on top of Bra #2. Remember me saying something about the fabric under the cups bunching up? Well, after changing to the larger wires, it still isn’t lying perfectly smoothly, but it definitely looks better, now that it’s not being crammed in by too-small wires. I’ll just chalk the rest up to lack of experience with the lingerie elastic method. The bottom line: Even though I originally made this bra as a practice one, it now fits me well enough to actually wear it— hurrah! And I know from wearing the nearly identical second bra several times now that it’s really comfortable, and even luxurious, with its beautiful silk fabric and lace trim. Sometimes the solution to a fit problem really can be this simple! ArteCrafts Launches New Website, Celebrates with Free Shipping! They’re both lovely bras, and that’s simply incredible that your first two bras fit so well. I’m practically drooling over the thought of making bras with silk. Oh my! Yes, I have personally had a problem with underwire size, so I know from experience it does matter. Thanks again for your great tutorials.